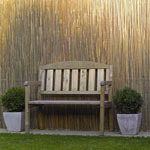 This durable green coated wire fence is perfect for creating an attractive edging to lawns, pathway and garden borders. 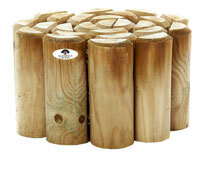 Each of the pack of 8 panels has spiked feet for easy fixing into the ground. 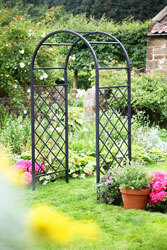 These traditional hoop topped low fence can easy be connected together to form fence around the contour of your garden borders. 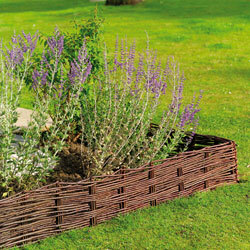 This garden edging will create a focal point to any part of the garden. Size of each fence: 300cm wide x 20cm high. These garden edging is a traditional looking lawn edge with detailed Fleur de Lys design. 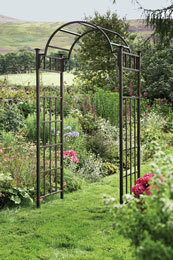 This garden edge is made from metal with a bronze effect finish to withstand weather conditions. This landscape edging has spiked feet for easy installation. This edging for garden attach via hooks together. Size: 24" (60cm) wide x 20" (50cm). This is a decorative and elegant edging for gardens with scrolled design detail. This edging for borders is made from metal with a white-grey wash finish to withstand weather conditions. This edging for grass has spiked feet for easy installation. This bed edging for garden attach via hooks together. This lawn edging has decorative rose design making a very decorative path edging. These garden edging borders are made from metal with a painted cream finish to withstand weather conditions. This steel landscape edging has spiked feet for easy installation. This steel lawn edging attach via hooking together. 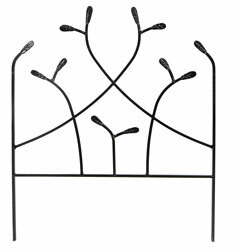 This metal edging for lawns has detailed leaf and bird design. 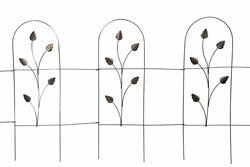 These metal garden edging are made from metal with a rustic finish to withstand weather conditions. This fence edging has spiked feet for easy installation. This edging fence attach via hooking together. 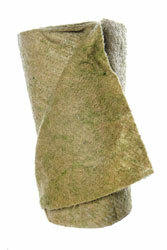 This garden border edging is both practical and decorative, use to add a clean line to your garden borders. This metal lawn edging has an arched lattice design. This border edging for gardens has scroll embellishment on the bottom panel. This flower border edging has a verdigris finish. Size: 45cm High x 60cm Wide. 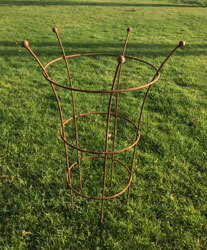 Size: 104cm High x 60cm Wide. 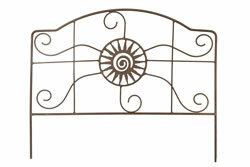 Crooked border edging is a contemporary design with wavy uprights. 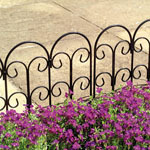 This metal lawn edging will create an instant garden border. These garden borders have 3 ground spikes to give extra stability. 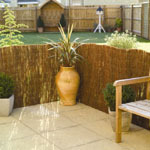 This garden border edge is PVC coated to withstand any weather conditions. This garden border edging is both practical and decorative, use to add a clean line to your garden borders. This metal lawn edging has an arched lattice design. 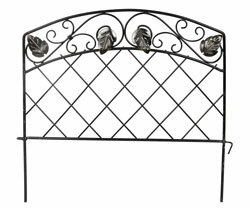 This border edging has a classic design with arched top section. 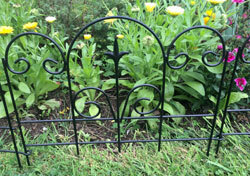 This flower border edging has 3 ground spikes for stability. Size: 100cm High x 60cm Wide. This path or border edging is decorative scrolled edging suitable for garden borders, garden beds, garden paths and driveways. Size: 0.45 metre x 0.41 metre. 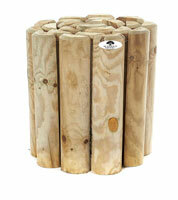 Available for sale wood edging for garden borders in different heights and lengths. Please click the image to view all these products. 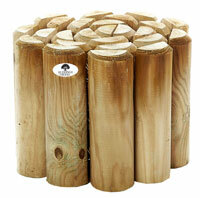 Please take a look at our range of willow hurdle for edging garden borders. To see our range click on the image.